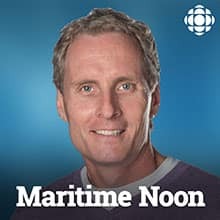 Maritime Noon delivers developing stories in the region, and keeps you up-to-date on breaking news. We track down the experts to help you make smart choices, and we always open the conversation up to you. It's about Maritimers talking to Maritimers. Love letters written by WWI soldier training in Halifax, unearthed in the basement of a building in Manitoba, Feedback on rough play zones, Phone-in on a world designed for men. Flood concerns in NB as spring melt arrives, Feedback on call to end daily prayer in NB legislature, Phone-in with David Moscrop, author of "Too Dumb For Democracy?" Download April 3rd, 2019 - Flood concerns in NB as spring melt arrives, Feedback on call to end daily prayer in NB legislature, Phone-in with the author "Too Dumb For Democracy?" NB Green Party MLA Kevin Arseneau calls for an end to opening prayer in legislature, Feedback on the joy of sewing, Phone-in on with Lorraine Massey, author of "Silver Hair: A Handbook"
Maritime Noon broadcasts live from the Peter McKee Community Food Centre in Moncton, N.B. for a special show about housing insecurity and what it means to be homeless in the Maritimes. Ontario may be about to ban cell phones from classrooms in the upcoming school year. Why one professor says it's not a good idea. On the phone-in: political alternatives to mainstream parties. Remembering Peter deMarsh of N.B., who died in the Ethiopian Airlines plane crash. An Indigenous elder says her traditional medicines were desecrated by airport security. Jim White phone-in. A PEI baseball association aims to take the politics out of picking players for its top youth teams. Feedback on the SNC-Lavalin affair. On the phone-in: our appliance repair expert. A family finds themselves in a pickle after a photo-op on the Irish Vale ice wall. Feedback on cabinet minister Bernadette Jordan's SNC-Lavalin affair interview. Call-in on semi-retirement. A Dartmouth man wraps up writing a song a week for a year. Your feedback on aging well and "fair dealing" copyright. And chef Craig Flinn takes calls on plant-based recipes. Debate around federal Parliament's Copyright Act review. Feedback on Uber in the Maritimes. Phone-in on aging well. Ron James on a new satellite radio deal that could be bad news for Canadian comedians. Feedback on Saint John's deer feeding ban. On the phone-in: Is it time for Uber in the Maritimes? The city of Saint John passes a bylaw to prohibit people from feeding deer. Your feedback on a recently reported cougar sighting in Digby County. And we take your calls for tax season. Days after a fatal fire in Spryfield, we hear about a community vigil for the Barho family. The CEO of problem-plagued Cannabis NB resigns. Call in on writing and executing wills. What a Halifax student expects from the Prime Minister's apology for a racial profiling incident on Parliament Hill. Your comments on reading aloud. And we take calls on DIY carpentry. Details of a fatal house fire near Halifax that killed seven children from a family of Syrian refugees. Our automotive expert Doug Bethune takes calls. NB nurse describes efforts to get out of Haiti during violent protests, Feedback on backyard birds, Michael Palin takes calls about his book "Erebus"
Download NB nurse on trying to get out of Haiti during protests, Feedback on backyard birds, Michael Palin takes calls about his book "Erebus"
Podcaster Jordan Bonaparte on his interview with the woman who planned to massacre people in a Halifax shopping mall, Phone-in with Benjamin Spall on the importance of a good morning routine. New Brunswick man's land donation helps preserve Nova Scotia's endangered moose population. PEI fire department rescues a horse that fell on ice. Call-in on our exposure to toxic chemicals. Atlantic University Sports explains their decision to suspend 15 players, two coaches following a hockey brawl between StFX and Acadia. Feedback on a listener's suggestion for remediating Boat Harbour. Phone-in on whether there should be mandatory re-testing for older drivers. Woman describes how her registered AED was called for by an emergency text, feedback on suggestion that Pictou First Nation could be moved rather than shut down Boat Harbour treatment facility, Phone-in on millennials in the workplace. NS driver captures dashcam video of speeding driver on wrong side of the highway, Feedback on Northern Pulp's request for a Boat Harbour extension, Phone-in with our Home Renovation experts. Reaction to the New Brunswick government's "no" to hosting the Francophonie Games. Countdown to Boat Harbour's closure. Phone-in on new farmers. A Cape Breton man named the Eat More chocolate bar. Feedback on the new Canada Food Guide. And a professional organizer takes de-cluttering calls.